The Wychwood brewery is located in Witney, Oxford County, England. This small city is known by the three “B’s”: Bread, Blankets and Beers. From 1841 to 1961, the Clinch brewery, a family business and local institution, used to produce beer and owned several pubs in town. The closure of this brewery marked the end of an era for a whole generation of Witney inhabitants. 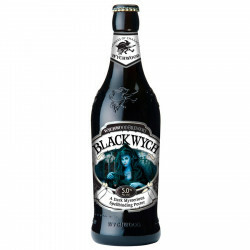 An enchanting, mysterious and very dark english Porter, Black Wych is a silky beer with a strong caracter. In 1983, Paddy Glenny bought the brewery and renamed it The Eagle Brewery. In 1985, 800 casks are produced per year. In 1990, Ian Rogers buys Glenny’s shares and the brewery became the Wychwood Brewery, named after a nearby medieval forest. He forms the project of opening a chain of 40 themed pubs inspired from the forest’s myths and legends. In 1997, more than 30 000 casks are produced each year. In 2002, the pubs are sold but some kept the Wychwood themed decoration. On the same year, Rogers buys the Brakspear Brewery of Henley-on-Thames. The two breweries combined make Wychwood the first producer of traditional ale.